Diabetes remains the 7th leading cause of death in the United States in 2010, with 69,071 death certificates listing it as the underlying cause of death, and a total of 234,051 death certificates listing diabetes as an underlying or contributing cause of death1. 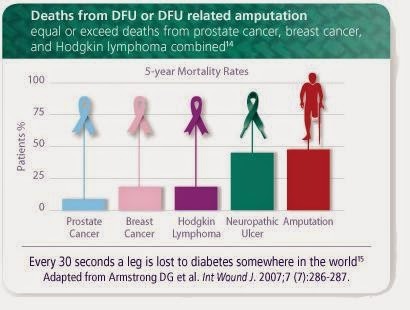 One of the common contributing causes of death in diabetes is a diabetic foot ulcer (DFU), and if left untreated could lead to lower extremity amputation (LEA). Five-year mortality rates after new-onset diabetic ulceration have been reported between 43% and 55% and up to 74% for patients with lower-extremity amputation2. These rates are higher than those for several types of cancer including prostate, breast, colon, and Hodgkin's disease. Approximately 15% of all diabetic patients will get a foot ulcer in their life3. Foot ulcers occur due to lack of sensation to the foot. Peripheral neuropathy, another condition commonly found in diabetics, damages the nerves, impairing sensation to the foot. This allows injuries to go unnoticed, leading to infections and ulceration. Diabetic foot ulcers are extremely difficult to treat, and it would take months for the wound to heal and incidence of reoccurrence is high. In the U.S., approximately 67% of all lower extremity amputations occur in diabetics, and approximately 85% are preceded by a foot ulcer4. The key in stopping diabetic foot ulcers and possible amputations is to practice proper foot care and to control diabetes. Wash feet regularly. Use a mild antibacterial soap and towel dry. Keep foot dry. Use antiperspirant powder when wearing shoes to keep your feet dry. Excess moisture can soften the skin, making it vulnerable to skin breaks and infections. Moisturize. A foot that is too dry is susceptible to skin cracks, moisturize with your favorite lotion. Look for cracks or scratches and treat immediately with an antibiotic ointment. Check for sensation on your foot. If there is decreased sensation than usual, immediately visit your doctor. From time to time, inspect the insides of your shoes if there is a pebble or anything protruding that could injure your foot. Go on a diet. Control food consumption to prevent increase in blood sugar levels. Do not miss your doctor’s appointments/check-ups. 4 Pecoraro RE, Reiber GE, Burgess EM. Pathways to diabetic limb amputation: basis for prevention. Diabetes Care 1990;13:513--21. If you are confused about which type of foot massager should you buy; then I will advice you to see firstly foot massager reviews .It will give you idea about market status and you can be known of best massager's features. Many people suggest me to use foot massager for my back pain. One month ago i started to use best foot massager brand. It's work very well. I love to use foot massager.